Please note: Iran News Now is not affiliated in any way with the labeled source of this video, Mashregh News. Nor do we know who they are or represent. We are posting this video because it shows Ahmadinejad’s right-hand man, Rahim Mashaei, being confronted by a pro-regime crowd during the regime’s 22 Bahman rally in celebration of the 32nd anniversary of the founding of the Islamic Republic. Rahim Mashaei is a controversial figure in Iranian politics. He has close family ties to Ahmadinejad, and has made statements and done things that cross the red lines as set out by the regime of Iran’s self-labeled Supreme Leader, Ayatollah Khamenei. He has said that Iran does not harbor animosity towards the Israeli people. This caused an uproar amongst the regime hardliners. He has also said that Iranian foreign policy should be of the Iranian school of thought (taboo in Iran because the current regime espouses a reactionary Khomeinist Islamic school of thought). Ahmadinejad had appointed him as one of his vice-presidents following the rigged presidential election. This act upset virtually the entire spectrum of the branches within the regime, from the Revolutionary Guards, to the Iranian Parliament (Majles), to the Judiciary, to the Supreme Leader himself, who ordered that Ahmadinejad remove him from this role. Ahmadinejad took a week to comply with the order, and did so reluctantly. However, he immediately appointed Mashaei as his chief of staff. 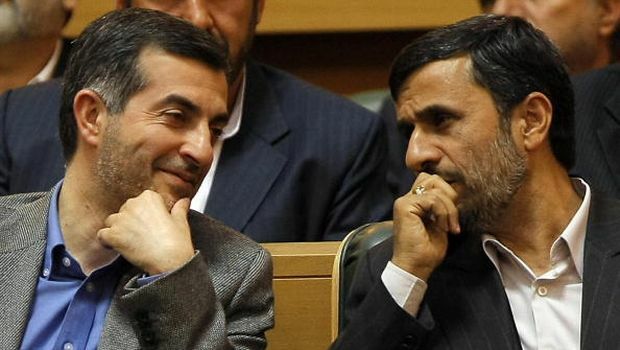 It is believed widely that Mashaei is Ahmadinejad’s close advisor. In this video, pro-regime individuals surround him and accuse him of being “monafegh” a term the regime regularly uses when referring to the Mojahedin Khargh Organization (MKO). Also chants of “Death to the anti-supreme-leader!” can be heard. Mashaei attempts to talk to some of them and eventually ends up getting into a vehicle which drives off while people heckle him.